If Richard Nixon lost the 1960 presidential race because he didn’t know how to play to the cameras, President Barack Obama is the opposite: He seems very comfortable in front of the camera (or in the garage, as the case may be). 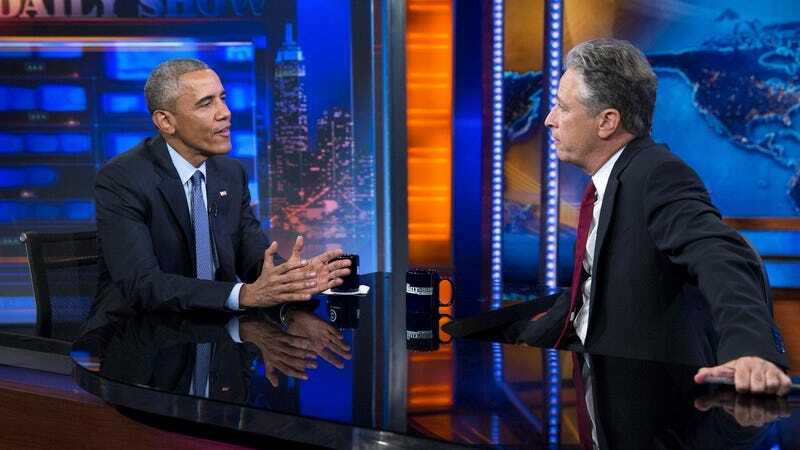 Free from the populist restraints of running for re-election, Obama continued his Urban Liberal Media Tour—sponsored by soy lattes and only reading the headlines of NPR articles—last night with his seventh and final appearance on The Daily Show, soon to be without Jon Stewart. Both men looking a little grayer from the stress of running America/America’s most trusted fake news outlet, after a rapturous reception from the crowd Obama joked that he was ”issuing an executive order than Jon Stewart cannot leave the show.” “It’s being challenged in the courts,” he added, to which Stewart replied, “To me, this is a states’ rights issue.” That led to a discussion of Obama’s plans for his final year as president—including his proposed nuclear deal with Iran—his relationship with the media (or “the medias,” plural, as Obama puts it), the rising cost of college education, getting young people interested in public service, and Obama’s advice for “future President Trump.” The full, three-part interview is below.